This 2016 special edition Lamy Logo fountain pen has a cylindrical body with a dark purple/brown finish, a spring mounted steel clip, and a medium steel nib. It comes with a Lamy ink cartridge to get you started writing right away! It also accepts the Lamy Z26 converter (sold separately) to use bottled ink.Designed by Wolfgang Fabian this Lamy logo fountain pen has sharp lines & an elegant stylish appearance. It has a sleek steel barrel with a special edition twilight finish. 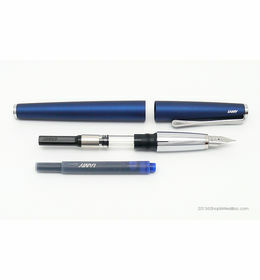 This is enhanced by a ringed section at the front to promote a solid grip.The pen has a polished steel pocket clip that is spring mounted and Lamy is subtly embossed on the cap. 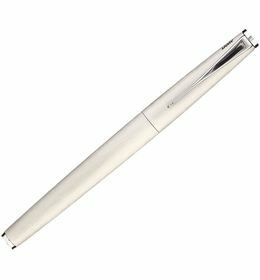 The nib is stainless steel & available in medium only. 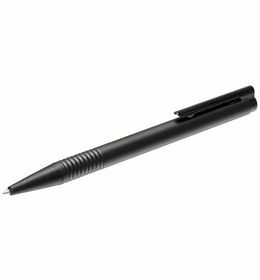 This nib is a Lamy Z50 nib so it could be changed for a different nib but this would need to be purchased separately.This Lamy logo fountain pen can use either Lamy T10 ink cartridges or bottled ink with an optional Lamy Z26 converter. This 2016 special edition Lamy Logo fountain pen has a cylindrical body with a dark purple/brown finish, a spring mounted steel clip, and a medium steel nib. It comes with a Lamy ink cartridge to get you started writing right away! It also accepts the Lamy Z26 converter (sold separately) to use bottled ink.Designed by Wolfgang Fabian this Lamy logo fountain pen has sharp lines & an elegant stylish appearance. It has a sleek steel barrel with a special edition twilight finish. 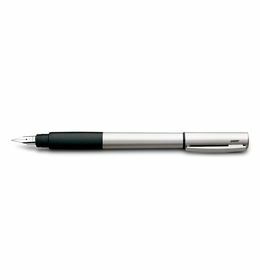 This is enhanced by a ringed section at the front to promote a solid grip.The pen has a polished steel pocket clip that is spring mounted and Lamy is subtly embossed on the cap. 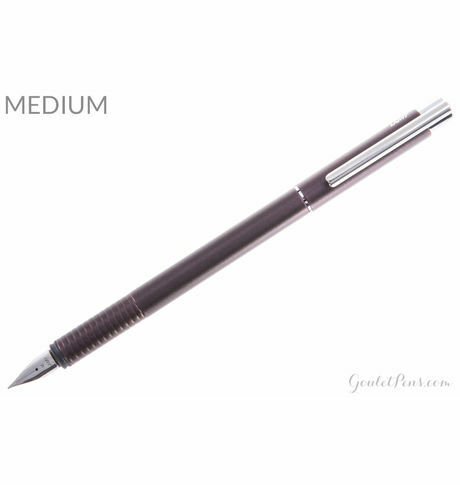 The nib is stainless steel & available in medium only. This nib is a Lamy Z50 nib so it could be changed for a different nib but this would need to be purchased separately.This Lamy logo fountain pen can use either Lamy T10 ink cartridges or bottled ink with an optional Lamy Z26 converter. Cancellation and Return Policy: • Cancellation: Upto 24 hours of departure is fine • Returns: No returns/exchange or refund. • Warranty as per our standard warranty conditions.